Theologically speaking, there is something for everybody in The Shack, but mostly in the sense that there is something for everybody in a meatloaf. 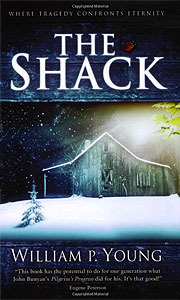 After writing about The Shack a couple of months ago, I finally got around to reading it recently. And as Heller suggests, it’s about a lot of things: sort of a weird stew of conventional Christian theology mixed with lots of new-agey spiritualism whose goal is to reconnect you with Christ. Among other things, Young rattles on about the Trinity, the nature of time, what it’s like in heaven, the power of redemption, and a hundred other things. At its heart, though, The Shack is concerned with perhaps Christianity’s most intractable question: why does an omnipotent God permit the existence of evil? In other words, it’s a meditation on theodicy. I suppose it says something that this is enough to sell 7 million copies (or whatever it’s up to now). I’m not sure what, but something. Here’s Heller’s crack at it: “[Young’s] theories — how to believe in Adam while supporting particle-physics research; why the Lord is OK with your preference for lewd funk more than staid church music — accomplish what mainstream faiths tend to fail at: connecting recondite doctrine to the tastes, rhythms, and mores of modern life. The Shack’s wild success doesn’t reveal how Bible-thumpy this country is. It shows how alienated from religion we’ve become. And though the novel, as a novel, is a sinner’s distance from perfection, it’s an eloquent reminder that, for those who give some faith and effort to the writing craft, there is, even today, the chance to touch and heal enough strangers to work a little miracle.” Maybe so. 1Plus God gives him a glimpse of Missy in heaven, and she’s pretty happy there. So that helps too.